Share some basic information about your property & receive quotes from local estate agents including their fees, service, and experience. LocalAgentFinder is free to use with no obligation. You request quotes, local estate agents provide quotes. Simple. Complete basic details about your property and requirements. All local agents are welcome to provide an online quote. Typically 5-10 agents will respond with online quotes within 48 hours, outlining their fees, service, and expertise. You'll start to understand what agents charge in your area; helping you to make informed decisions when you're ready. Find out why thousands of homeowners have trusted LocalAgentFinder to find a local estate agent to sell or let their property. I would like to say – I received an excellent and extremely professional response from the agents that responded through LocalAgentFinder, and would like to thank you for offering such a great service! I found LocalAgentFinder an excellent way to have agents contact me. I had agents contact and appraise my home and I was extremely happy with my choice of agent. Using this service meant that I didn't have to do the legwork, they came to me! This is so easy to use and best of all, it's FREE and saved me A LOT OF TIME. I advertised my unit and had 4 agents respond within 6 hours. You don't have to contact all of them, just the ones you feel most comfortable with and offer you the best packages. I would highly recommend this website to anyone who is looking to change property management and doesn't know where to start. You have nothing to lose! If it wasn't for your website, I would not have heard of the agent I chose. It gave me the opportunity to compare rates and commissions and then choose to meet with whom I wished. I found it very useful and thank you. I found the LocalAgentFinder online process easy to navigate and register. It took the headache out of trying to contact each real estate agency individually. The overview allowed me to concentrate on what I was looking for and what questions to ask. There are just so many estate agents out there, so getting a starting direction was excellent! I think this site is a great idea, when I decided to let out my property I had no idea where to go, where to begin or what I was doing so it was exactly what I needed. Agents responded quickly, and I was spoilt for choice! You'll receive detail about agents' fees. Agents will give you background about themselves and how they do business. All quotes are presented in an identical online format for easy comparison. You'll start receiving responses almost immediately and you should have them all within 2 days. Why you should use LocalAgentFinder and how it's free. There's so much more to your search for an agent than finding the lowest commission. On LocalAgentFinder you can dig deeper, requesting written quotes from a wide range of local agents. All quotes are presented in the same format, making comparison simple and uncovering important information that agents might not otherwise share. LocalAgentFinder is 100% free to you. While you're under no obligation to use any agents that respond to your quote request, if you do successfully sell or let with an agent from LocalAgentFinder, they pay a referral fee. This is standard industry practice and identical for every agent. 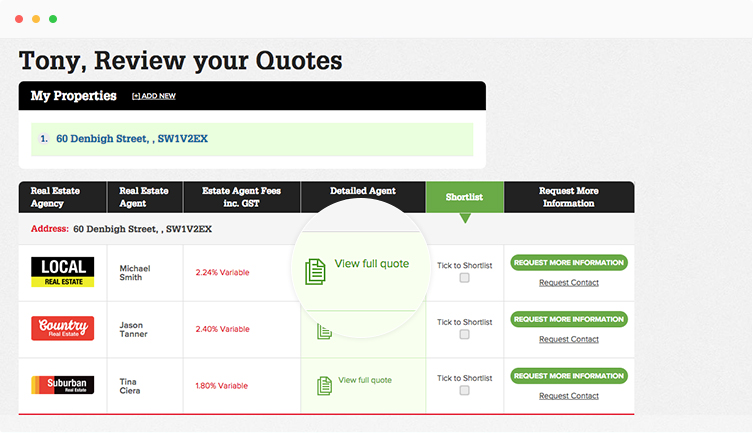 When you request quotes from local agents on LocalAgentFinder, they can't see who you are, or even your address. This ensures they have to put their best quote forward first time. Once agents have submitted quotes, you choose which ones to view and send them basic contact details so they can follow-up with tailored information via email. You can keep your phone number private at all times. How long do agents take to respond? The opportunity to pitch for your property listing is only open to agents for 1 week. The majority of responses are received within hours and proactive agents will respond immediately.